I am using Stumpwm from last 2 years and a month back I came to know about GNOME 3. Little bit googling will tell you the kind of harsh and brutal criticism GNOME 3 developers have received for their new ideas. MATE and Cinnamon have come out of that criticism to preserve traditional desktop look and feel. So what is this new interface in GNOME 3 ? Well you can read HIG (Human Interface Guidelines) of GNOME project, I am here to talk about practical aspects not mentioned anywhere but have come out of my own experience of using GNOME 3 for few minutes. I order to explain that you need to know something about dektop and window managers. I am not a fan of desktop. I focus on work I need to do and then find methods to accomplish the task in an effcient and faster way without wasting time and energy. This way of thinking had pushed me from Desktop to virtual WMs (window manager), virtual and floating WMs and then to pure tiling WMs. Hence I travelled from KDE, GNOME and Xfce few years back to Fvwm, windowmaker and then to wmii, xmonad and now to Stumpwm and Ratpoison. Still I keep an eye on how different technologies develop in software world and that is how I came to know about new developments in GNOME 3. As per the viewpoint of an average user there are two kinds of interfaces you get on computer: an ugly, hard to use, anti-user black command line and a beautiful, cozy, pleasing and user-friendly graphical-interface a.k.a desktop . Almost all average “Joes” love desktop as it works faster for them (in fact, it is actually opposite). Come to Linux world, we have desktops too, unlike all those average Joes believing otherwise. A desktop usually has menus, folders, windows, icons, supports atractive features like drag and drop, openeing a document/file/folder by double-clicking etc. On Command-Line you have to type commands to do anything and you don’t get icons, windows, menus and or any fancy stuff requiring graphical interface. These are two opposing ways average Joe thinks computers are. Come to Linux world again, here we have X Window System on the top of which a desktop runs. X Window System is the first graphical interface. What I mean by that ? X is the base on the top of which any graphical interface (or GUI) runs as far as Linux is concerned. While Windows XP users only have one kind of desktop, Linux has several as per the likes and needs of the users, GNOME, KDE and Xfce etc. This kind of design gives a lot of flexibility, power and control to Linux users. Like I mentioned earlier a desktop environment consists of several components. Along with menus, icons, panel etc., it has a window manager and a file manager (check Wikipedia for full list). What most users want is to do the necessary work and then get on with life e.g one person wants to write an email and hence uses a browser, one wants to watch a movie, one wants to his office work and others just want to browse the internet and many want to do all of these (and that includes me too). So, they need something which is simple, helps them do tasks in an effective way and finishes tasks fast. That was my motto and that pushed me towards Linux after I was mentally tortured, made insane and almost killed psychologically by Windows’s virus problems, frequent slow downs, weekly-installations and loads of other crap that every Windows user has experienced. Coming back to Linux, now if there is a way to finish the tasks faster then that means current way of doing work must be inferior because if you already doing what is best then there is no way you need anything else. There is another way of saying this: you are doing tasks in an effective way and there is always room for improvement and there is lot of room if what you are doing is being done same way from a decade. . 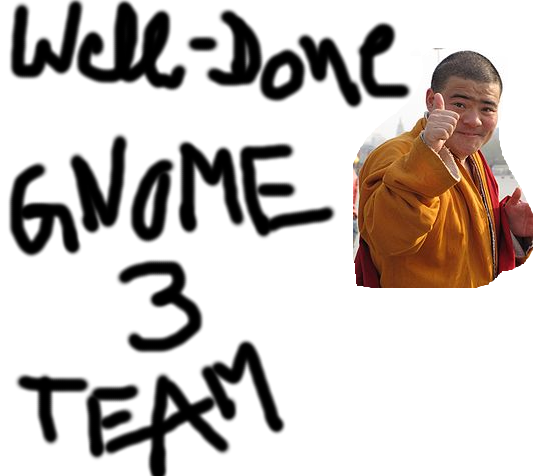 I think that is exactly what GNOME team was thinking when they were laying the foundation for GNOME 3. What is this new foundation ? For that I need to explain tiling WMs. In a tiling WM (I use StumpWM) there is no minimize/maximize/resize when it comes to your windows (when you open an application e.g a video player then it opens in a window. If you open 2 applications e.g. video player (lets say VLC) and a browser (lets say Firefox) then you got 2 windows, Firefox window and VLC window). In a usual desktop you can minimize/maximize/resize any window and each window will have buttons to do that including a button, which looks like leter ‘x’, to close the window, usually these 3 buttons are in upper right corner of a window). A tiling WM does not provide any of these facilities, windows will always be maximized and no buttons. Tiling WMs are based on concept that a user wastes too much time in minimizing/maximizing/resizing windows, changing their locations and sizes across the screen and they are right. Screen is divided into panes, like a Paned-Window, and you will have one window in one pane. There are no menus, no icons, almost nil mouse support (yes, no left-right clicks and tricks), tiling WMs are keyboard driven. You want any application then know its name and run it as a command and you will not waste your time in trying to find it inside menus or searching pseudonym driven icons/shortcuts and finding where that shortcut points to when you accidentlly loose one. When you sit in front of your computer then most of your attention should be on your work, not on distractions and pure tiling WMs make you do exactly that.